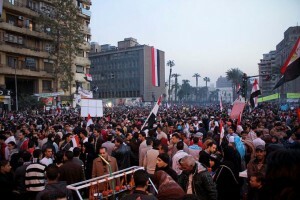 Egyptians, protesting before Mohammed Morsi government, welcomed the news that the President lost his powers. This was announced on Wednesday by the Egyptian troop’s general Abdel Fattah al-Sisi. General Sisi confirmed that the Constitution of Egypt is suspended, and the Chief Judge of the Constitutional Court takes President’s post until the new head of the county will be elected. General of the army mentioned in his speech that these measures are in the plan, which is intended to respond the interests of the country and reach national reconciliation. After General language all Muslim Brotherhood’s television channels were stopped and the security forces were located around major public buildings and meeting places of protestants. Near Tahrir Square and CairoUniversity troops guarded protestants from attacks or assaults. It could be heard in square not only whoops of joy, but also sounds of warning shots. Luckily, when one of the bullets hit Muslim Brotherhood’s member in the leg, other supporters left to stand quietly in front of tanks, calling for end of the military regime. Most of the demonstrations in Egypt were peaceful; unfortunately, there were victims. At first during the clashes of the President’s supporters and opponents and protestant’s invasion to the seat of Muslim Brotherhood at least 23 people were killed. Two more, it is believed children, lost their lives during the clashes on Thursday, and on this Friday the Egyptian soldier was killed, when rockets were fired into a police station in Rafah. In total, during the unrest in Egypt, about 50 people died and hundreds more were injured. Moreover, there were sexual assaults in the protests. As BBC reported, Mohammed Morsi and heads of the Muslim Brotherhood are in detention, other of them is being searched. Brotherhood refused the idea to cooperate with the Egyptian army. Deposed President condemned behavior of military forces on his Facebook page. M.Morsi still expects to negotiate, and is convinced that he is legitimate president, elected in a free and democratic elections in 2012 – in June. For this reason, M.Morsi sees any attempt to overthrow the president as a military coup, and disregard of democratic principles. Meanwhile, protestants such actions identifies just as correction and recovery of the situation. This Mohammed Morsi’s position received a response from the U.S. President on Monday. During telephone conversation Barack Obama urged M.Mursi response to public reaction in order to stop the crisis and not undermine democracy, because democracy doesn’t mean only elections. In other posts United States encouraged to avoid arrests and quickly return to the government, elected in a democratic way. However, it seems that after the revolution in 2011 and overthrow of legally elected president democracy of the Egypt has a lot of unanswered and unsolved issues. These events were named as step back in democracy by many European countries, as well. Unrest in Egypt started on Sunday when people gathered in Tahrir Square, demanding Mohammed Morsi resignation. Egyptians criticized him for influence of Islamic principles, rising crime, and incapacity to restore a stable economic and political situation of the country. Mass protests in Egypt were organized by the oppositional movement “Tamarod”. It submitted the President deadline to resign by 5 pm on Tuesday, threatening with civil disobedience campaign. The situation reached top and military forces took control of the country after the second ultimatum, this time given by the army. Before intervention military leaders openly expressed support for the protestants because of president’s Islamic positions and failure trying to respond to the needs of public. General Abdel Fattah al-Sisi felt duty to correct the situation and demanded the president to meet the requirements of the people and find a way out of the civil crisis in the next 48 hours, threatening with military intervention. These changes occurred, when Mohammed Morsi still couldn’t find a common language with the opposition and people.